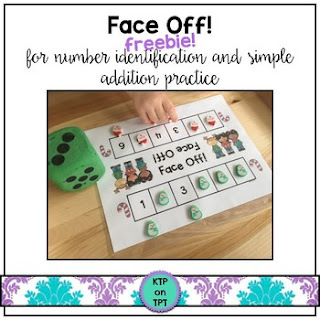 Face Off is an exciting math center game that my students ❤️LOVE❤️ to play! It is engaging and fun for them, plus it helps with basic number identification and simple addition skills. This is a *FREE* sample of my fun Face Off game! The full 200 page pack includes 2 themed game boards for each month, and each month includes 3 different types of games Within each set, there is a version for numbers 1 - 6 (ideal for Kindergarten and beginning of year First Grade), a version for 2 - 12 and a version for 11 - 16 (ideal for end of year Kinder and First Grade). Please check out the freebie and leave me some feedback below! Click HERE to check out the full game! I know your students will love it as much as mine do!